The outstanding quality and durability of industrial embroidery machines, condensed into a compact body. Bring color to your business with SAI, the model that offers high quality finishing with production power. Super compact design for portability and table top use. Touchscreen 3.5 x 6in full colour LCD control panel which is easy to learn. Fast 800 stitches per minute. Rotate designs and select the design stop/start position on screen. Large 11.8 × 7.8in (300 x 200mm) tubular sewing field. Large 11.8 × 2.9in (300 x 75mm) cap sewing field. Includes one 11.8 × 7.8in (300 x 200mm) hoop, one 3.9 × 3.9in (100 x 100mm) hoop. Crosshair laser marker for easy and accurate design placement. Double LED lit sewing field. Six beautiful fonts to create on-board lettering for text and monograms. Includes Tajima Writer lettering software for Windows with 30+ Fonts and built-in design templates with easy LAN machine connection capability. 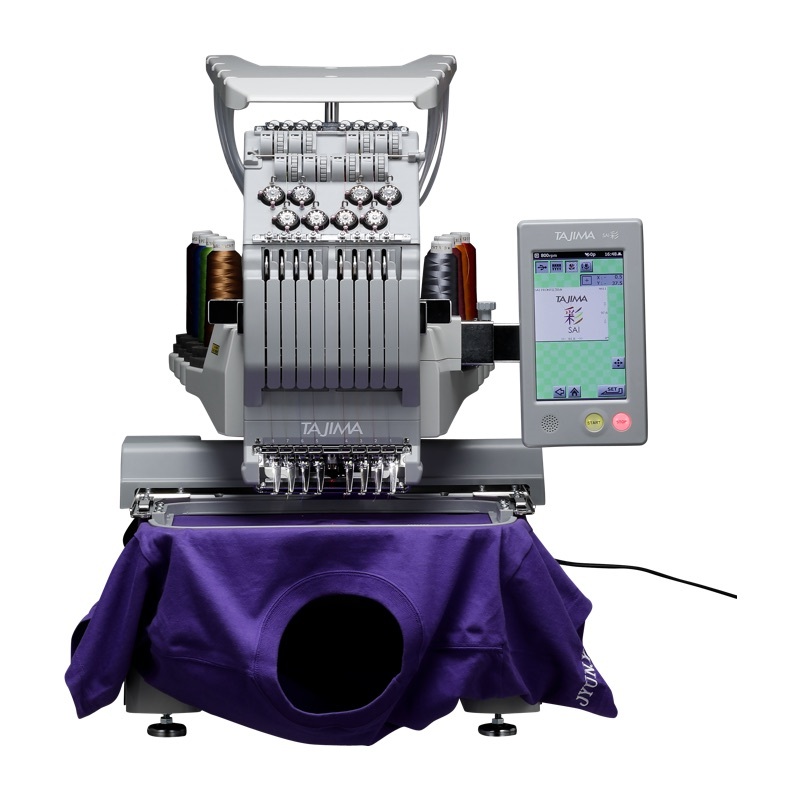 Barcode ready: All Tajima embroidery machines have built in technology to load a design to the machine with the simple scan of a barcode or simply drop into a hot folder. Cap stabilisation shaft: The cap stabilisation shaft allows for high speed cap embroidery with precision results. Unique Pulse .pxf labour saving embroidery file format compatible.